Please contact me for an introductory orientation to Smathers Libraries collections of rare books and unique manuscripts relating to Africa. This page is intended to offer just a few examples of the kinds of resources available (including original materials and reproductions of large archival collections either in digital/online or microfilm formats). For manuscripts available onsite, you may browse by subject for African Studies, or locate the Smathers Libraries page for Special and Area Studies Collections, and use the link for Finding Aids. These are designed to allow researchers to know the context and content of manuscripts papers to determine their research value (the index is by collector). Our UF Digital Collections (UFDC) also includes digitized versions of parts or all of many manuscripts held in the department and for African Studies Collections. I'm always happy to arrange an individual consultation or can present to groups or a class on the many resources available onsite and online. Our largest African specific digital archives collections are: African Blue Books, 1821-1953 and Colonial Law in Africa, 1920-1945 (in three sections for 1808-1919, 1920-1945, and 1946-1966). Under the Beginning your research tab, the page for Humanities research & primary sources includes a good number of leads for other primary resources collections online. A geographical description of the four parts of the world taken from the notes and workes of the famous Monsieur Sanson, geographer to the French king, and other eminent travellers and authors. To which are added the commodities, coyns, weights, and measu by Blome, Richard. London, Printed by T. N. for R. Blome, and are also sold by N. Brooks, E. Brewster, and T. Basset, 1670. 5 p. l.,  p. col. pl., 25 fold. maps. 43 cm. Five parts, separately paged, but with continuous signatures. Blome’s atlas includes several beautiful, historically important maps of the African continent. 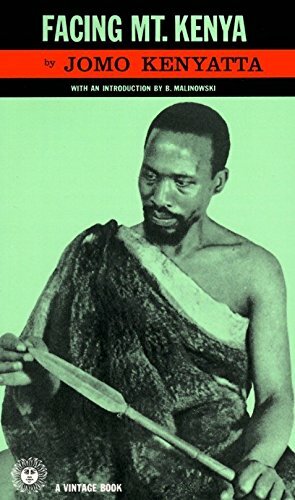 These seventeenth century publications provide direct insight on how Africa and Africans were perceived by Europeans during this important time period. 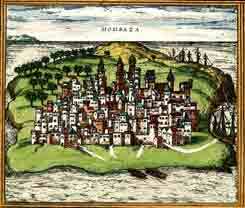 The view of Mombasa at the left is a detail from a map print in our collection, "Aden, Mombaza, Quiloa, Cefala" or Civitates Orbis Terrarum (1572-1618). Books were at this time luxury goods owned only by the most wealthy, elite members of society (the introduction of the printing press in 1453 greatly increased the speed of book distribution, and according to contemporary observers dropped prices by 80 percent, but broad distribution to a wide range of readers was slow to develop). Prior to mass production of books, even examples from several hundred years ago are generally supple, easy to handle, and a pleasure to read. Note that most books were sold without boards or covers at this time period, and the current bindings weren't contemporary with their printing. Class discussion centers on early books as luxury goods, uses for various editions, and the re-use of engraved plates (would now be considered plagiarism). Also discuss provenance and variation in bindings and paper quality, etc. Consider printing and binding expenses, artifactual value (vs. intellectual value of contents), condition, and provenance. Discuss changes in printing technology (woodcut vs. copper plate detail, durability for larger editions, resolution), contemporary knowledge of Africa by Europeans (reading the text and illustrations or cartouches for cultural-historical cues). Historical context of seventeenth century Europe (Age of Discovery, transmittal of African indigenous knowledge, trade routes, landmarks, and distances to Arab historians and European traders, etc.). 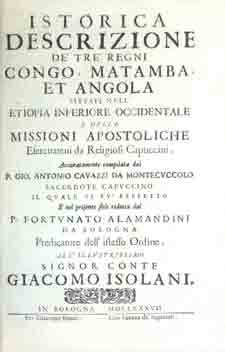 Istorica descrizione de' tre' regni Congo, Matamba et Angola: sitvati nell'Etiopia inferiore occidentale e delle missioni apostoliche esercitateui da religiosi Capuccini. by Cavazzi, Giovanni Antonio (d. 1692?) and Fortunato Alamandini. 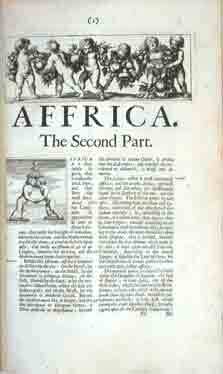 A state-of-the-art, illustrated encyclopedia resulting from a papal mission to Kongo, Matamba, and Angola. John Thorton (1979. History in Africa 6:253) describes this as "one of the most important sources for the reconstruction of the social, political, economic, and religious history of these three Central African states in the seventeenth century." Theatrum orbis terrarum. Italian. Compendio dal theatro del mondo di Abrahamo Ortelio. In Anversa,: Si vende nella Libraria Plantiniana, M.DC.XII. by Ortelius, Abraham (1527-1598). 8 p. l., 106 [3 l., 3 blank l., 1 l.], 12 l., [1 l., 2 blank l.] : ill., coat of arms, , 106, 12 maps ; 14 x 19 cm. Dedication signed: "Gioanni. Bapta. Vrientio." "Questo Theatro piccolo d'Abrahamo Ortelio, Cosmographo Regio, tradotto in Italiano da Giouanni Paulet d'Anuersa ... a di xii. di Nouembre. 1592. ":--Verso P5. A pocket-sized, Italian language edition of Ortelius’ famous first world atlas. Consider what topics and which books were popular at different time periods, how tastes changed during the nineteenth and twentieth centuries. It's also interesting to look at differences in African and other readers' tastes: who reads what, where, and when? Why? What factors influence taste in reading materials? Facing Mount Kenya; the tribal life of Gikuyu. by Kenyatta, Jomo. Introduction by B. Malinowski. London, Secker and Warburg . First edition copies of the imprisoned Jomo (later, President) Kenyatta’s famous ethnography are rare, as most were stored prior to distribution in a warehouse that was bombed during the London Blitz of September, 1940. Discussion of colonial policies relating to leaders of the independence movements, “Mau Mau” prison camps and group punishment in the case of the Kikuyu people in Kenya. 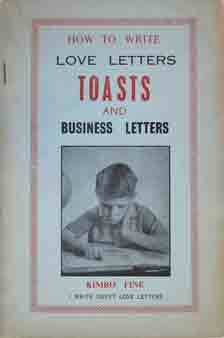 How to write love letters, toasts and business letters. by Onwudiwe, Eric Speedy. An example of “Onitsha Market literature” from our collection. These pamphlets were written, published, and sold by and to many Igbo people newly literate in English. The use of letter presses and type sold secondhand by missions and government offices allows the tracking of their use through forensic clues in the type itself (sometimes mixed on a single page). Port Harcourt, Nigeria : Vincent Okeanu, c/o Eastern Bookshop, <196-?>. Mœurs, usages et costumes de tous les peuples du monde, d'après des documents authentiques et les voyages des plus récents. by Wahlen, Auguste [1785-1850]. This multi-volume set includes illustrations of costumes, dress, and local fashions throughout the world. It's easy to imagine readers sitting at home, daydreaming about exotic international travels while leafing through the pages of these large books. Fine arts press books are created with special, artistic, craft-focused attention to the full range of the book arts (ink, paper, typographic design, creative writing, printing techniques, graphic design, bindings, etc.). These represent a vision of what a book can be when created as an organic whole, with full attention to the quality of every element of production. They guide readers back to the historical moment when books were created with the full devotion and attention of expert craftspeople, and which have proven to survive quite well over many centuries. At the same time they demonstrate a new vision for book production in the 21st century, reminding us that books don't have to be only a package for marketing content, but can be artifacts worthy of appreciation on their own terms. Almost no fine arts press books consider African related topics, so these examples from Khelcom represent an even smaller, super-specialized niche of an already arcane bit of the book market. The Smathers Libraries hold a full set of Bogardus work on African topics to date: Touba-New York (2004), Meskel Demera (2008), Burake (2010), Seventeen trees (2011), Ba suri (2013), and Places of reverence (2018). To our knowledge no other library holds all (thought 35 other libraries own one or more) of these beautiful works. Touba - New York. 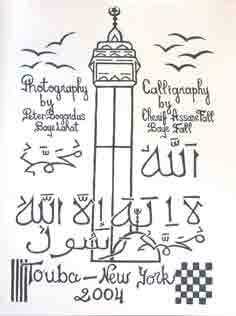 by Bogardus, Peter; photography by Peter Bogardus ; calligraphy by Cherif Assane Fall. New York : Khelcom Press, [2005?]. Around 1881 in Senegal, Shaykh Admad Bamba Mbacke founded the Muridya, or Murid Brotherhood, a Sufi Muslim movement dedicated to the promotion of peace among humans and the respectful worship of the Creator by all. There is a strong Murid presence among Senegalese ex-patriots in New York City and it has transformed many neighborhoods in Harlem. Yet very little notice is given by main stream media to this ecstatically peaceful outpost of West African culture; consequently, very few people, even in Manhattan, are aware of its existence. 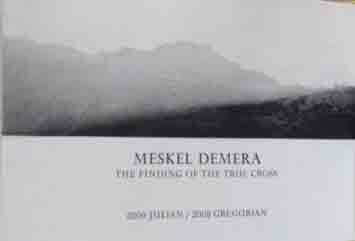 Meskel Demera : the finding of the True Cross. by Bogardus, Peter ; photographs and woodcuts by Peter Bogardus ; commentary by Zelalem Haile Michael. New York, N.Y. : Khelcom Press, 2008. "Sixteen original copper-plate photogravures were made and printed by the photographer, who also carved the fourteen woodblocks of imagery and sacred text drawn from Ge'ez scrolls and books. Takuji Hamanaka printed the blocks with hand-levigated mineral pigments. The text by Zelalem Haile Michael was printed by Art Larson at Horton Tank Graphics using Perpetua type cast by Michael Bixler. The book has been handbound in linen-covered boards by Gray Parrot and is offered in a matching box."--Colophon. Julian 2000 is listed on the t.p. in addition to the Gregorian date of 2008. Prospectus laid in. Gray Parrot binder's ticket on inside back cover. Harold and Mary Jean Hanson Rare Books Collection copy is no. 5 of 52. Language: Text in English and Ge'ez (the language of the Ethiopian Orthodox Church). "Printed in an edition of fifty-two by letterpress, woodblock and photogravure. 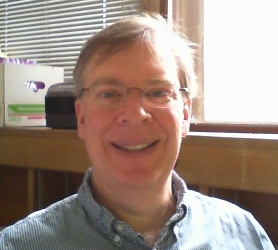 Peter Bogardus has made the text, woodblocks, and photographs. Zelalem Haile Michael is the interpreter in Ethiopia. The text is printed at Horton Tank Graphics by Art Larson using Monotype Perpetua cast by Michael Bixler. The woodblocks were drawn directly from Ge'ez scrolls and carved at Khelcom New York, where the copper-plate photogravures were printed. The blocks were printed by Takuji Hamanaka using powdered minerals. The paper is Iwano's kumohada mashi in a fore-edge fold"--Colophon. Issued in linen cloth clamshell case (28 cm.). Gray Parrot binder's ticket on inside back cover. No. 5 of a limited edition of 52 copies. "Seventeen trees was printed in an edition of thirty-nine. Thirty-six copperplate photogravures have been printed by the photographer from plates he made at Jon Goodman Photogravure, using hand-milled ink made from selected historical pigments on Twinrocker paper handmade in Indiana. The text was printed by Art Larson from Monotype Perpetua cast in metal by Michael Bixler. It was written by the photographer with the benefit of a close reading by Chris Covert and Gray Parrot. This book is for the trees and all those they gather."--Colophon. Harold and Mary Jean Hanson Rare Book Collection copy is no. 18 of 39 signed by the author. Harold and Mary Jean Hanson Rare Book Collection copy was acquired through the support of the Dr. Madelyn M. Lockhart Endowment in African Studies. Contents: The welcoming tree : Mount Ziquala, Ethiopia -- Oda, council tree : Gelcha, Ethiopia -- Boatbuilding yard : Kafountine, Senegal -- Hamer granary, woven in branches : Wollo, Ethiopia -- Dogon council hall : Songo, Mali -- Ogooue River's edge : Lambarene or Lambarwery, Gabon -- Cave entrance : Sof Umer, Ethiopia -- Rock garden (Valley of Marvels) : Babille, Ethiopia -- Sideways tree : Arsi Robe, Ethiopia -- Natural bridge : Kembatta, Ethiopia --Walled city raptor's perch : Harar, Ethiopia -- Nest-filled tree by city entrance : Djenne, Mali -- Hermits and mystics at Mass : Mount Ziquala, Ethiopia -- Keur Baye Si : Djiourbel, Senegal -- Keryou happy tree : Dulecha, Ethiopa -- Ancestral tree : Farafenni, the Gambia -- Sokhnas' zikr : Touba, Senegal. African Studies related manuscripts in our primary source collections include materials collected by and/or relating to: Lewis Berner (a UF biologist who conducted anti-malaria work in West Africa during World War II), Gwendolen M. Carter (a political scientist focusing on South Africa and the anti-Apartheid struggle), Graham and Brian Child (wildlife conservation in Southern Africa, Brian is a UF Geographer), Ronald Cohen (retired UF anthropologist who workied in Northern Nigeria), the East African Professional Hunters Association (Kenya), George Fortune (a lingusit of Southern Bantu languages), Frank Jolles (collector of Richard Ndimande's Studio Photographs from South Africa), Rene Lemarchand (retired UF political science professor's materials largely relating to Rwanda and Burundi), Eugene Manis (a plant breeder who worked on a Firestone plantation in Liberia in 1941), Martin Rikli (filmmaker's photographic albums and related materials on Ethiopia at the time of the Second Italo-Ethiopian War of 1935-'36), and George Shepperson (historian's collection relating to Livingstone). Several small collections relate to particular author's works, and some miscellaneous topical collections including Notre Congo a collector card album on the former Belgian Congo. Use the Finding Aids and Browse by collection title or Browse by Subject links for more information. While not special collections in the reproduction format our library owns, these are important collections of archival materials that may be difficult and expensive for researchers to access in the orignal. Archives available on microfilm include missionary society records; colonial government publications for Nigeria, Tanganyika and Zanzibar (Tanzania), Kenya, Uganda, Northern and Southern Rhodesia (Zambia and Zimbabwe), and Nyasaland (Malawi). Other large archival sets include the Bascom Yoruba collection and the files of the Sahel Documentation Center. Note that many other collections not listed here are available to UF users via Interlibrary Loan from the Center for Research Libraries (CRL). Please feel free to contact a librarian for assistance in requests for CRL film sets; as institutional members, our users have the right to borrow large sets of microfilm for extended periods of time in order to pursue specialized research with these materials. In some cases, online guides are available for assistance in working with these large, sometimes complex, materials. For example, see these guides for the CMS records, as well as the guides to the series of colonial government records titled "Government publications relating to African countries prior to independence" (see links from individual countries listed above). Government publications relating to Southern Rhodesia, 1890-1963, and to the federation of Rhodesia and Nyasaland, 1953-1963. East Ardsley, West Yorkshire : Microform Ltd., 1982. Description: 113 microfilm reels ; 35 mm. For all UF held titles in this series, search for "Government publications relating to African countries prior to independence." Joint archives for the Conference of British Missionary Societies and the International Missionary Council, Africa and India, 1910-1945. Original manuscripts in the Library of the School of Oriental and African Studies, London. Holdings: boxes 200-447, 1202-1240. Our holdings relate mostly to British Africa, but contain material on areas under Belgian, Portuguese, and French control. Coverage includes educational policy and the development of National Christian Councils. 1791-1948. Originals held in the Wesleyan Methodist Missionary Society Archive in the University of London School of Oriental and African Studies Library. [London] Kodak Ltd., Recordak Division, 1960. Contents: Committee of Correspondence records, 1799-1880. CA1: West Africa Mission (reels 1-52). CA2: Yoruba Mission (reels 52-82). CA5: East Africa Mission (reels 91-99). CA6: Nyanza Mission (reels 82, 99-103). Foreign Group Committee records, 1881-1920. Group 3, Africa. G3A2: Yoruba Mission (reels 133-152). Call Number: SCIENCE LIBRARY Microfiche -- Sahel coll. New York, NY : Norman Ross Publ., 1993. Na Imprensa Nacional, 1854-1865. 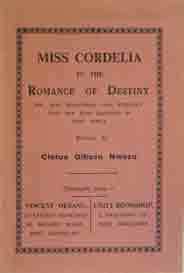 The first publication printed in Mozambique. Totals about 2,344 pages sized 8.5 x 13 inches in the original paper. Return to an address of The Honourable The House of Commons, dated 29 June 1827 ; - for copies or extracts of any correspondence which may have recently passed ... : House of Commons, 1828. by Great Britain Colonial Office. Correspondence between His Majesty's government and the sovereign chief of Madagascar. Of interest is the personal tone of this letter, announcing the death of a sovereign leader. Current news from and about Biafra. New York, N.Y. : American Committee to Keep Biafra Alive, Inc., 1969-1970. "A journal of liberal and radical opinion." ISSN: 0034-0979. Thanks to the late Professor Gwendolen M. Carter, we hold a good run of this important anti-Apartheid journal from a critical period in South Africa’s history (1976-‘86). Alan Paton (1903-1988), a former math and physics teacher and anti-authoritarian reform school principal, is best known for his novel Cry, the Beloved Country. He helped to found the multiracial Liberal Party under South Africa’s Apartheid regime and became the party's president in 1956 and continued to play an active role until it was forced to disband in 1968 after passage of the Prohibition of Political Interference Act. 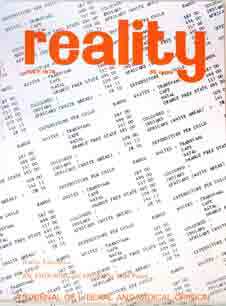 In 1969 he became founding editor of Reality. Tanganyika notes and records. [Dar es Salaam, Tanzania: Tanganyika Society, 1936-1965]. Publishing History: No. 1 (Mar. 1936)-no. 64 (Mar. 1965). Continued by Tanzania Notes and Records. “Onitsha Market literature” can be identified by using this phrase in the catalog or online. If you're looking for photo archives of Africa, I highly recommend ILISSAfrica's Guide to historical photographs from Africa on the web. The guide covers a great deal of resources.